W. Chris Winter, MD, Sleep specialist, neurologist, and author of The Sleep Solution: Why Your Sleep is Broken and How to Fix It. “Sleeping Around” is a recurring blog post series where Dr. Winter, a sleep specialist, goes beyond the typical topics related to healthy sleep and seeks out the most unique sleep circumstances to offer his assistance in how to tackle them. Even if your problems are not as extreme, hopefully the experience can help shed some light on your own sleep difficulties. Two days after Christmas, a young snowboarder went missing on Cypress Mountain in Vancouver, British Columbia. The young 20 year-old survived the frigid night before he was rescued by sleeping in a snow cave. What is it like to sleep in frigid conditions protected only by a frozen shelter? What can it teach us about our own sleep? As a sleep specialist, I’ve slept in many unusual places. I always assumed I would venture into the land of Arctic accommodations by booking a stay in Northern Sweeden’s Icehotel or maybe Quebec City’s luxurious Hotel de Glace. 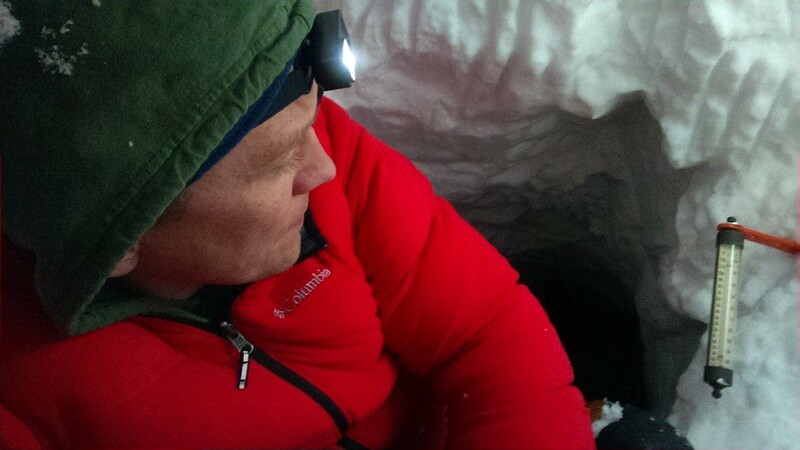 With ski season underway and not wanting to be caught unprepared if I ventured off the slope, I thought it might be a good idea to learn the ins and outs of building a snow cave, and spend the night in one. Show shelters, sometimes referred to as quinzhees, are not new. They have been constructed and utilized as temporary shelters by inhabitants of cold climates for many years. Unlike an igloo which is made by stacking blocks of ice, a quinzhee is made by hollowing out a mound of snow. For many individuals who are forced to construct a snow cave for survival, that snow mound must first be manually piled up. Fortunately for me, it snowed recently, and finding a suitable drift is not a problem. The first issue to address in the construction of a snow cave is the suitability of the snow. If the weather conditions or snow are not right, the snow may not adequately sinter (or strengthen as it compacts). In that case, you might be stuck simply sleeping in a trench! My snow is not only compacting well, but has already settled and is quite dense. For an adequate snow cave, a pile of five feet is usually necessary. I work slowly to create the cave. Working too quickly can produce sweating which is an issue in a survival situation. Once I’m able to get my entire body inside, I start hollowing upwards, smoothing out the dome of my cave so dripping is not an issue during the night. I start digging upwards so that the sleeping level is higher than the entrance. With the cave created, it was time to prepare for the night. The first part of that process includes informing my wife of my plan. The snow cave produces more resistance than I expected. “What happens if it collapses?” It is a fair question and a risk that is real. Fortunately mine has been built in a avalanche-free zone in a stable environment. I also feel confident about my ability to get out should it collapse. I do not bother to tell her that during the cave’s construction, it became very clear that yelling from inside the cave is virtually impossible to hear outside the cave, and vice versa. Snow absorbs sound remarkably well. Hesitant blessing secured, I prepare for the night. The first thing I pack is an ensolite pad to insulate my sleeping sack from the snow I’ll be sleeping on. I pack a 20 degree sleeping bag, meaning I should be comfortable if the temperature in the cave stays above 20 degrees Fahrenheit. To measure temperatures, I pack a thermometer. Some wool clothing, gloves, a headlamp, and a cell phone finish the supplies. It’s go time. Temperature has a tremendous influence on sleep. It not only affects how much we sleep, but ambient temperature also affects the quality of our sleep — even changing the distribution of our sleep stages (REM sleep/dream sleep, deep sleep, etc.). We think about temperatures in the mid to low 60’s as being optimal for sleep. This is sometimes referred to as the thermoneutral zone (TNZ). As our temperature deviates from that TNZ sweet spot, we tend to sleep less and spend predominantly more time in light sleep and less time in REM sleep. As temperatures decrease further, the time it takes to fall asleep increases and there is more wake time and restlessness recorded during the night, usually coming at the expense of REM sleep loss. These very low ambient temperatures can, in some cases, suppress REM sleep altogether. I arrive at the cave around 10:00 PM at night. It’s 25 degrees outside the cave, and unfortunately the same temperature inside. Once inside, I seal up the entrance with my bag and some blankets. One should never use snow to seal up the entrance as it could freeze making getting out difficult (as an added caution, I keep a shovel inside). The cave temperature immediately begins to rise. After taking some pictures, I spread my bag out on the mat and climb inside. I feel quite warm. After turning off my headlamp, it is pitch black, and otherworldly quiet. I set several alarms to awaken me every two hours to assess the cave, the temperature, and how I’m feeling. I have also arranged a “text if you’re okay” system: no text means my family needs to hustle out to the cave with lights and a shovel! I fall asleep quickly, but true to the research about sleeping in the cold, I am restless and awaken frequently. The alarm is really unnecessary. Strangely, I do not feel uncomfortable at all; it is as if the low temperature has a deeper effect on my sleep, outside of discomfort. My first temperature check around 2:00 am is 18 degrees F outside and a balmy 24 degrees F inside. Some snow caves can maintain an internal temperature of 32 degrees F even when the outside temperature is -40 degrees F. Note to self, I need to build a better front door next time. The rest of the night is successful if you judge success via the criteria of: 1) the cave did not collapse; 2) I stayed perfectly warm in the cave with no frostbite or issues related to oxygen/carbon dioxide; 3) I actually slept reasonably well. While restlessness was an issue, I felt fairly good during the day. The experiment has made it abundantly clear that while a cool sleep environment is optimal for good sleep, snow cave sleep should be reserved for survival situations only. Originally published at www.huffingtonpost.com on January 12, 2017.